Founded in 1974 by Kerstin Block and her husband Spencer in Tucson, Arizona—Buffalo Exchange has since blossomed to 45 stores across 17 states. Their mission is to help everyone live a fashionable, affordable and sustainable life by helping customers reduce, reuse and recycle their old, gently used clothing. 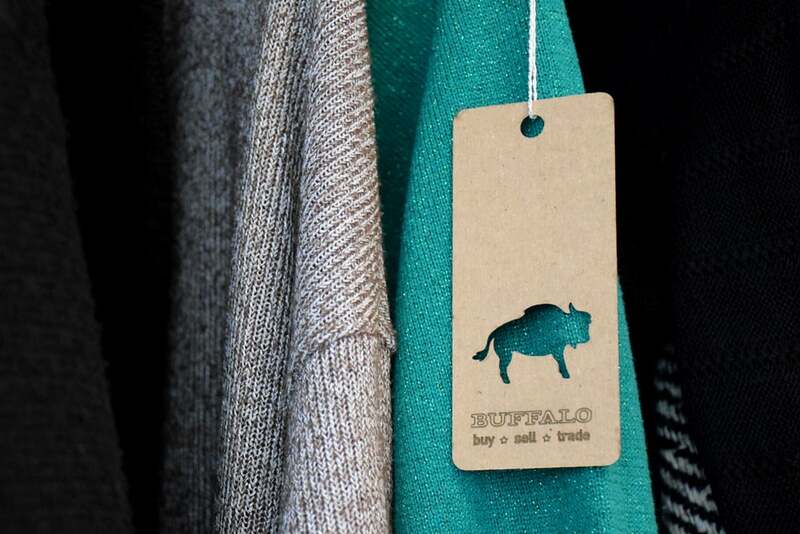 Unlike other larger secondhand stores, family-owned Buffalo Exchange emphasizes their ethical values with programs like Coats for Cubs and donating 5¢ to a partnered charity of your choice when you bring your own shopping bag. As a longtime Buffalo Exchange customer and admirer of the company, I wanted to change their image from punky and inconsistent to a cohesive, fun brand that reflects Buffalo Exchange's Southwestern roots. To celebrate the company’s 40th anniversary in 2014, Buffalo had a traveling pop-up shop full of cherry picked secondhand finds in a vintage airstream. But what if there was a smaller vehicle that regularly traveled around your city? Now there is. Introducing the “Buffalo Mobile": it’s like an ice cream truck for vintage clothes. Brand pattern for use on tote bags, in-store signage, etc. and secondary pictorial mark. Laser cut hangtag on recycled paper. The small, buffalo-shaped window highlights the variety and unique details of secondhand finds at Buffalo. Gift card and reusable drawstring gift pouch.